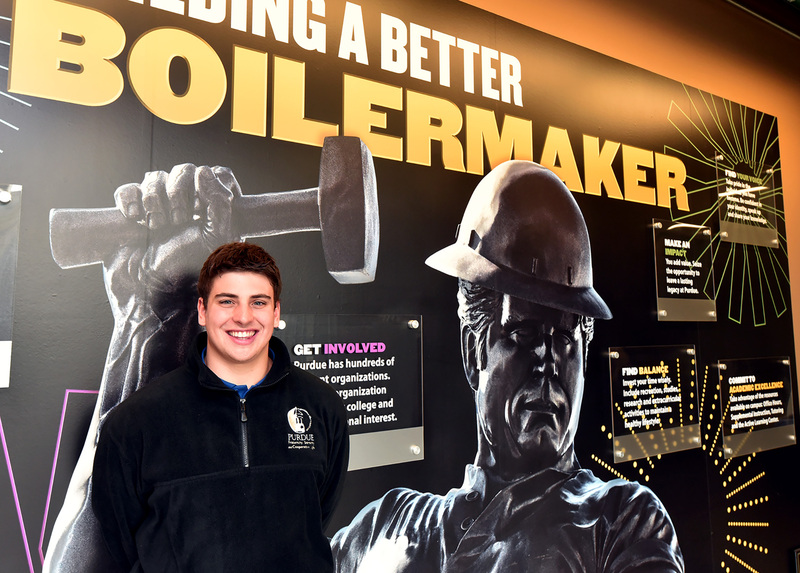 Making an impact in college can be a challenge, but for one Pi Kappa Phi member that opportunity will be as the leader of the Purdue fraternity system in 2019. Nathan Longo, chapter president in 2018, will take the reins of the 42-fraternity, 3,500-member system at Purdue in January. He will become the Pi Kappa Phi chapter’s first Interfraternity Council President since 2007. Longo worked with IFC in 2017 and wanted to serve in an executive assistant role in 2019. However, he was encouraged by his chapter brothers, fellow fraternity presidents, outgoing IFC officers and Purdue Greek advisers to be president. He was drafted and elected thereafter. Leading such a substantial Greek community does not intimidate him. “I think managing and navigating the larger administrative infrastructure that IFC and Purdue both have will be a unique experience that will more directly relate to something like running a business,” he said. IFC has five executive board members, six directors, five associate board members and the Presidents Council, which is made up of all of the chapters’ top leaders. The group works on new member recruitment as well as chapter development, scholarship, philanthropy, community service, member education, risk management and public relations, according to its website. 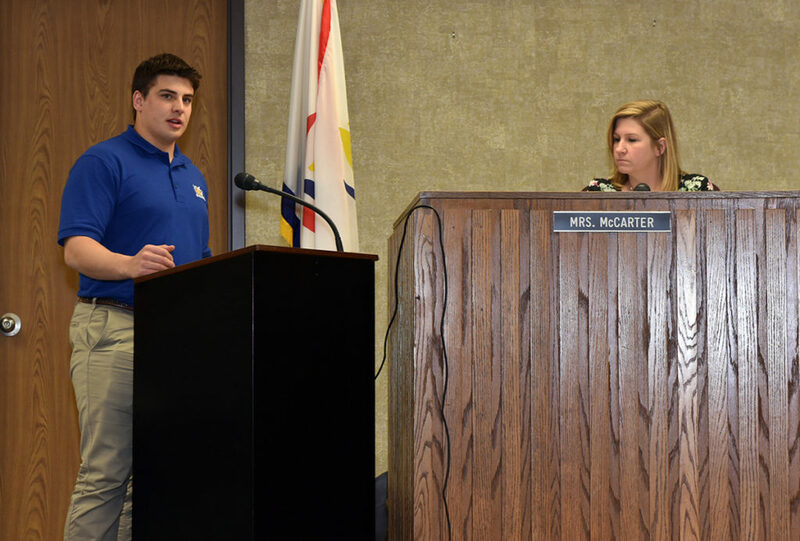 Nathan Longo, 2018 chapter president, addresses the Lafayette School Board during a Circle of Giving check presentation. Longo has a vision for building upon a Greek system richly entrenched into the Purdue community. “My goals for IFC as president are encompassed by three aspects: Improving implementation of health and safety policy, improving the way Purdue fraternities approach recruitment and fostering a culture of leadership in several areas within our community,” he said. The health and safety issues – aka risk management – are at the forefront of nationwide discussions about the roles Greek play in university communities. Challenges range from binge drinking to mental health as well as hazing to even life and death issues. “The areas I want to focus on with this are building a culture of leadership and understanding among our general population,” Longo said. Furthermore, he wants to work with the other Greek councils to implement health and safety policies. 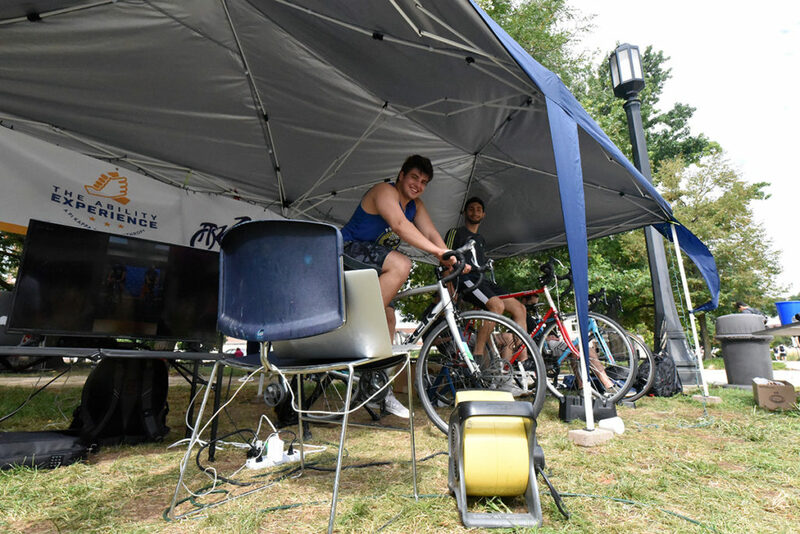 Longo rides in the Eighth Annual David Feltner 72-Hour Memorial Bike a Thon. Here he participates in a Facebook Life broadcast. As far as improving new member recruitment, Longo said he’s in favor of providing prospective new members an overview of the Greek community and explain that not all chapters focus on the same things. For example, there are fraternities that recruit men with specific academic majors, some that are religious-based, and others that focus on athletics, social, philanthropy or academics. Still others do not recruit for a specific emphasis at all. Accordingly, he wants to expand upon the traditional “Meet the Greeks” event, where all chapters man booths in a large open forum. “I think giving an opportunity for potential new members to quickly see every chapter will benefit both the chapters and the new members,” he said. His final major goal involves building a community of leaders across the Greek system. Furthermore, he hopes to push organizations to be true to their foundings. “If we make even just a small change building ‘grassroots’ leadership, our community will be much better off,” he said. After his term is over, he wants to be cognizant of where Greek organizations stand with administrators and university communities alike. Longo, a Columbus, Ohio, area native majoring in electrical engineering, will become Pi Kappa Phi’s first IFC president in more than a decade. 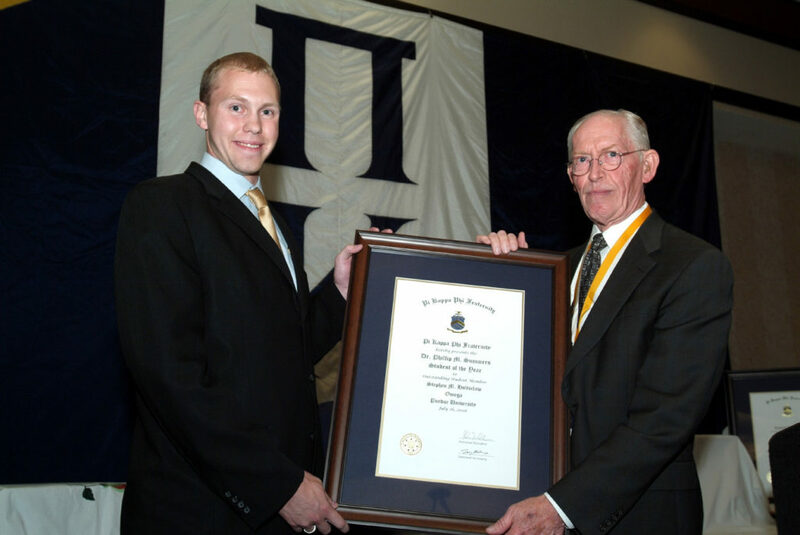 Steve Holtsclaw poses with the late Phil Summers after being presented with the Pi Kappa Phi Student of the Year Award inn 2008. Steve Holtsclaw held the position in 2007. His work with the US Department of Education on strategies to reduce risk issues for incoming freshmen as they encountered the Greek system brought him significant recognition. He received multiple honors including the Greek Man of the Year at Purdue and the Pi Kappa Phi Student of the Year nationally. Early in his chapter experience, he developed mentors who helped push him. 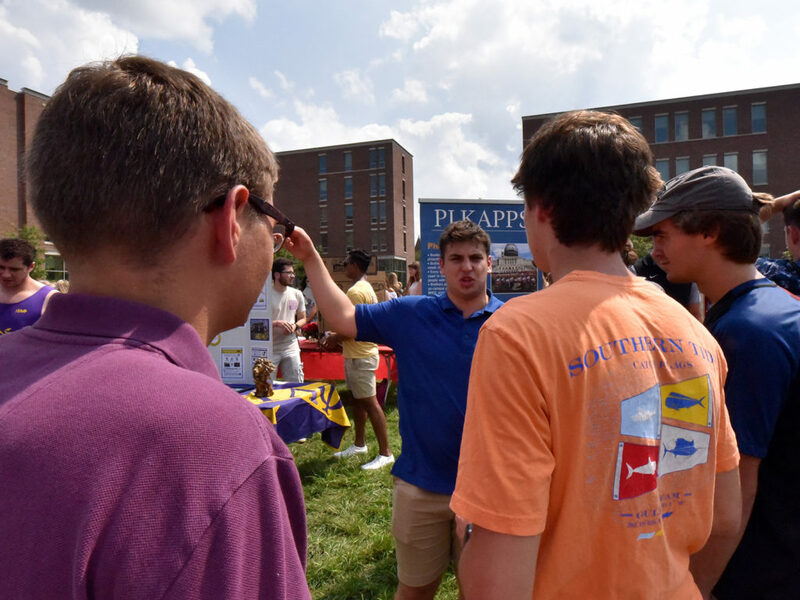 While on campus, he sought to learn what made other the top chapters successful and make that relevant to Pi Kappa Phi. Holtsclaw has used his finance undergraduate degree, alongside a Northwestern University MBA, to assist clinical drug trials for Eli Lilly, an Indianapolis-based international pharmaceutical company. As such, he oversees data analysis to inform future domestic and international drug trials. Longo has a very supporting family, too. His dad, Greg, was a fraternity member in college and was very supportive of his son joining a fraternity. His mom, Michelle, not so much. Mom eventually warmed to the idea, but she didn’t know anything about Pi Kappa Phi. 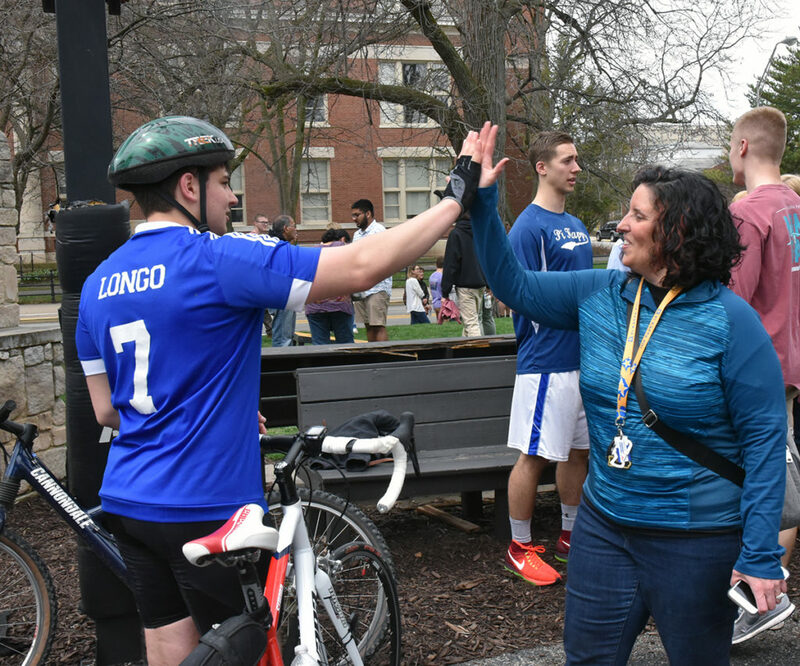 Nathan Longo and his mother, Michelle, exchange High 5s upon the completion of the 19th Annual Pi Kapp 100 in 2018. “Nathan shared all the statistics regarding its esteemed position on campus, but more importantly his gut feeling he was sensing about the men he had met during the recruitment and indoctrination process,” she said. “We trusted his judgment. Now, she’s overwhelmingly proud of him being IFC president. Longo speaks with potential new members during the Fall 2018 Meet the Greeks event.